Make your home feel like new again with fresh carpeting! Now is the time to pick out the type of carpet to you would like to make your home nice and cozy for the holidays and for guests and relatives who will be coming over. Coventry has a beautiful showroom with lots of carpet in stock for a quick turnaround. If you are busy we can come to you with our mobile showroom truck so you can match the carpet samples to your rooms. Today, consumer demand is all about softness. STAINMASTER® TruSoft® has ultra-soft fibers. TruSoft is made of nylon 6,6, which has been regarded as the best performing synthetic carpet fiber. Wool Carpet is a natural fiber that is one of most popular types of carpet for your home. Wool carpet is a natural fiber that resistant to moisture and mold. Wool is a long lasting material that wears nicely. Wool is the only natural fiber that makes it into the top four most popular types of carpeting. Make sure you Professionally Clean your carpet. Carpets that have absorbed a years’ worth of dirt and germs will need a deep cleaning to get them ready for another year of wear and tear. It does not matter when you deep clean your carpet just make sure that you do so every year. We recommend you contact a professional cleaner to clean your carpets. Open your windows to speed the drying process, which can take up to several days. 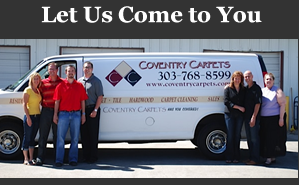 Be sure to call soon so we can get you on our schedule so that the carpet is installed sooner rather than later. Coventry is the home of the lifetime installation guarantee! Give us a call today to get started on a new look for your home!